In the days before cheap flights to Georgia (i.e. before Pegasus Airlines began flying between Istanbul's Sabiha Gökçen low-cost airport and Tbilisi), a cheap option for travelling from Europe was to fly to Trabzon on Turkey's Black Sea coast and to then make one's way to Tbilisi via Batumi. Even now, this is actually still a rather fun journey, and can take as little as a day and a night. The stretch of Black Sea coastline between Trabzon and Batumi is stunningly beautiful. Trabzon and Batumi themselves are concrete monstrosities, as indeed is most of the Black Sea coast, regardless of nationality or of the type of cement used, but the spirit of a more authentic past still haunts some of their neighbourhoods—and, besides, the urban sprawl which blights this part of the Black Sea coast has barely scratched the glorious mountains behind. It would be well beyond the scope of this page to try to include information on what to see on the way; there are plenty of guidebooks and online resources for this part of the world, so the main focus will be on the actual journey to Tbilisi. Even if you arrive late in Trabzon, you can already start moving towards the border. Local minibuses link every town and village along the Turkish Black Sea coast, and some even stop by the airport late at night on their way east. A minibus ride to the town of Sürmene, for example, takes as little as half an hour, and Rize is only 75 km. east of Trabzon along the coast. Every town has at least one or two cheap and perhaps-not-quite-so-cheerful hotels (Turkish: ucuz ama güzel otel var mı?—is there a nice but reasonably priced hotel around here? ), which will certainly be much better value and much more adventurous than anything on Salıh Yazıcı Sokak in Trabzon. The Otel Kent in Sürmene, for example, stuck between the old coastal road and the new coastal motorway, was perfectly all right in its "bring your own loo-paper" kind of way. Once at the border crossing itself, smile, remain calm, and be patient—or, if you want to blend in with the locals or distance yourself from some embarrassing fellow ferengi, wear dark clothes, scowl, talk loudly, and generally try to look too rich to have to wait. Your turn will come, and it could be so much worse: spare a thought for foreigners who cross the border in their own vehicle. Getting from Sarpi to Batumi is very straightfoward. There are plenty of marshrutkas, as their numerous drivers will no doubt inform you as soon as you emerge, on foot and carrying a large bag, from the Georgian side of the border crossing. There is even a municipal bus service (possibly roomier than taking a marshrutka, but no doubt a bit slower), and even a bus line which goes all the way to Batumi's railway station in the village of Makhinjauri, about 5-10 km. north of Batumi itself (practical if you want to head for the next train, and have no time for Batumi). Given Georgia's general unpredictability, one should allow half an hour for the journey to Batumi, and another 15-20 minutes for the trip to the railway station in Makhindjauri (a surname which in Georgian means something like "from Ugly"). Currently (May 2014), there are two day-trains from Makhindjauri to Tbilisi, taking around 5½ hours to cover the 342 km. which separate them. The first leaves at 07:55 (pulling in to Tbilisi station at 13:22) and the second at 18:00 (23:40); the morning train makes more sense, perhaps. The sleeper leaves at 22:10 (07:00 the next morning). Taking it is good fun if you equip yourself with a picnic, and best if you book both bunks in a first-class compartment, which would set you back GEL 80 (around EUR 30). Batumi also has its own international airport, with regular flights to Tbilisi and Istanbul and indeed to more unlikely places such as Belarus, Iraq, Israel, Kazakhstan, Russia, the Ukraine and the United Arab Emirates. A flight to Tbilisi takes around half an hour, and a return costs around GEL 250 (EUR 100). Dozens of buses and minibuses also ply the road to Tbilisi, and indeed fan out in every direction from Batumi's bus station. The "fast" option to Tbilisi involves a whole day of manic, pop-mp3-fuelled driving in an overcrowded minibus (almost certainly a Ford Transit), with lumbering Turkish lorries and insane locals in BMWs the least of your worries. Don't do it—unless you want to, of course. A much more pleasant and exciting "marshrutka adventure" option would be to travel along the route Batumi—Khulo—Goderdzi Pass (2,025 m.)—Adigeni—Akhaltsikhe—Borjomi—Tbilisi (summer only). 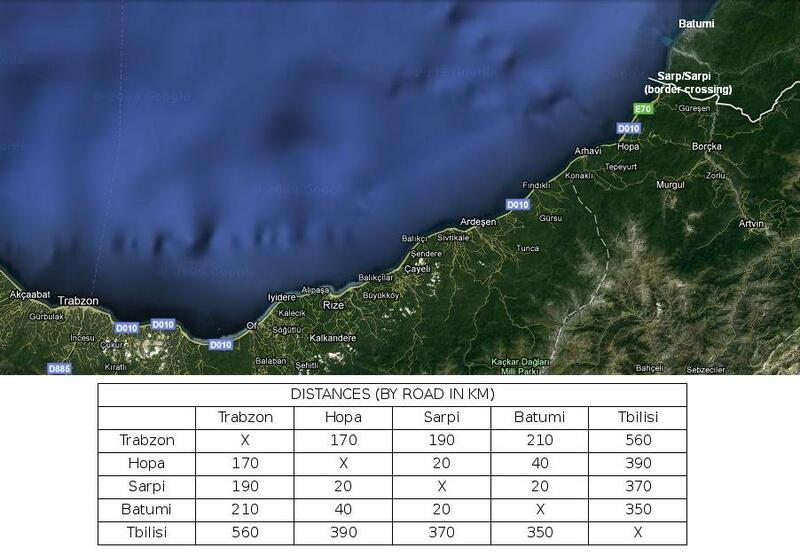 Or Batumi—Khulo—Goderdzi Pass (2,025 m.)—Adigeni—Zekari Pass (2,182 m.)—Baghdati—Zestaponi—Khashuri—Gori—Tbilisi (summer only). The possibilities are endless.